I had such high hopes for this book. Some sort of dialogue between Pope Francis and the Dalai Lama. Sure, it’s fiction, but if someone does their research right about the religions and what each man actually has said to show their theology, then you’ve got a good book. Point out the similarities between the two religions while showing the differences. You have to have a happy medium between those two. Basically, it has potential, but it was carried out in a way I wasn’t impressed with. There are four characters in this book. Pope Francis, the Dalai Lama, and two fictional ones. Paolo and Rosa. Estranged husband and wife. Paolo is also cousin to Pope Francis and works with him as well. 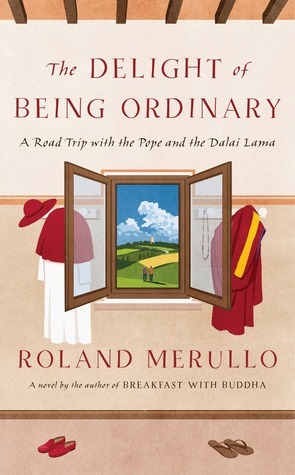 The way the description for this book phrases it, it puts Pope Francis and the Dalai Lama as the main characters, tagging on Rosa and Paolo to this. Aka, religion is first. I get the point of this book. Paolo is the typical everyday person with their own problems and not open to hearing wisdom. Pope Francis and the Dalai Lama teach him the religions. He learns and changes his ways. Not worried, get him and Rosa back together, etc. It was just so bad how it was done. I don’t want to hear all about Paolo and his issues. I’d suggest to skip this book and just go for books actually about the two religions and the two men. You’ll get more out of it. Can’t win them all! Sorry it didn’t work out. I was sad, too! I was hoping for something different than what I got. Should have paid more attention, I guess.